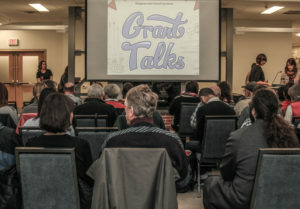 Grant Talks is an evening of conversation, engagement, and awareness-building around granting opportunities in the arts. Local, provincial, and national granting organizations come to Kingston to share granting opportunities, news, and information with our community. Every year we plan two events as part of this program: Grant Talks, witch a focus on regional and national opportunities and Grant Talks: CKAF Edition, with a focus on the City of Kingston Arts Fund, which the KAC administers on behalf of the Kingston Arts Council. In the past we have hosted organizations like: the Canada Council for the Arts, the Ontario Arts Council, the Kingston Association of Museums, the Community Foundation for Kingston & Area, the Ballytobin Foundation, the Davies Foundation, and Awesome Kingston. Recaps: 2016 Grant Talks, 2016 Grant Talks: CKAF Edition, 2015 Grant Talks.